Nori is an edible red seaweed that is popular in East Asia. Normally we use it to make Kimbap (Korean sushi), garnish for soup or noodles, or eat toasted nori strips for snack. What is good about it is that one nori sheet only contains 10 calories and high fibre – great for weight loss. Nori also has a very high iron content, important for formation of red blood cells. By eating two sheets of nori, you get as much iron as you would from drinking a glass or milk or eating an egg. It contains an extremely high concentration of protein for a plant. It is also a source of Vitamin B12, important nutrient for vegans. It affects the synthesis and regulation of DNA in the body. A study of Buddhist nuns in Korea who follow a largely vegan diet also showed no vitamin B12 deficiency, which suggests that the nori in their diet greatly contributed to healthy levels of vitamin B12. That’s why you should add nori seaweed a part of your nutritious diet. You can easily see sushi chains on the street or at the shopping centre these days. I believe it is still a healthier option compared to other junk food, but that white or brown rice in sushi is heavily seasoned with salt, vinegar and oil. On top of that, I can barely see any fillings (either veggies or protein). It is mostly rice, which is not great for your blood sugar level. 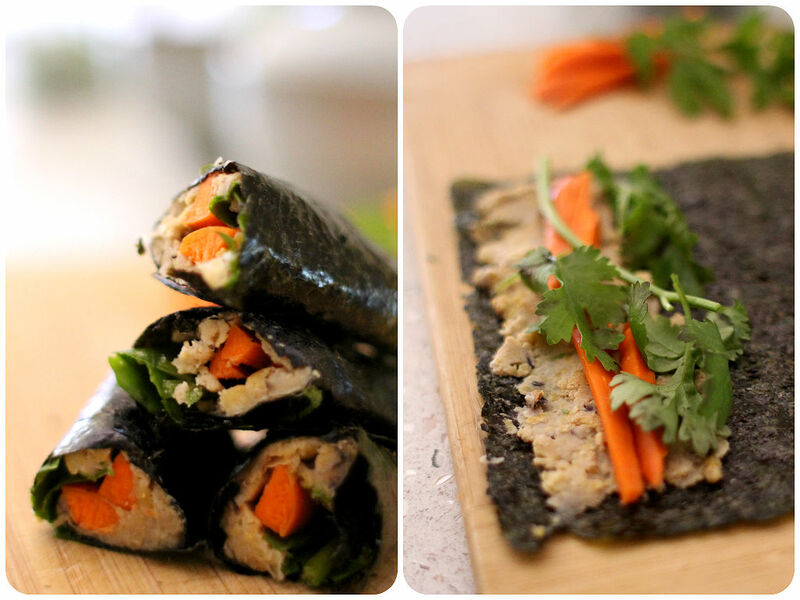 You can easily make healthy sushi at home with a few ingredients. I spread hummus instead of rice for more protein and fibre. It tastes great, too. You can add different veggie fillings such as avocado, cucumber, capsicum, sprouts, etc. Trust me! This tastes fresh, crunchy, yummy and healthy! To make hummus, cook soaked chickpeas in a boiling water for 20-30 minutes until cooked. Drain and put in your food processor along with other hummus ingredients. Add a bit of water if the mixture is too thick, but you want it to be quite chunky, thick and not too wet. Transfer the mixture to a bowl and let it cool completely. Wash and prepare your veggies. To assemble, place the nori sheets on a flat surface for filling. Slather the hummus on each sheet, topped with carrot and coriander. Roll the sheet into a tube, fairly tight. Dip your finger in water and wet the edge of the nori sheet which will allow it to stick closed.